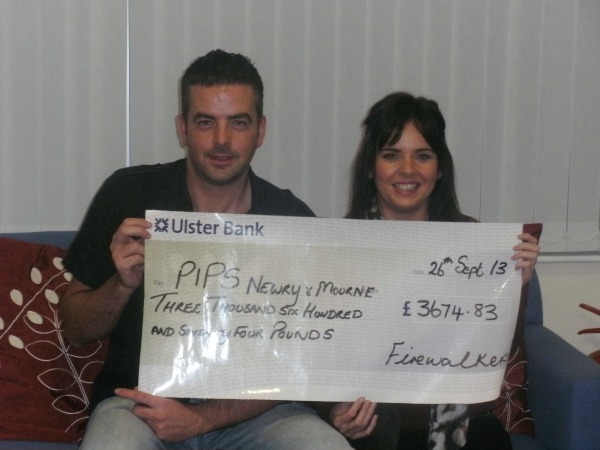 Orla Boyle Volunteer with PIPS Newry & Mourne presents Keith Brady PIPS Newry & Mourne with a cheque for £3674. Orla organised a Firewalk in June in Café Brass where over 20 people took part in the Firewalk to raise money for PIPS Newry & Mourne. Orla would like to thank everyone who took part in the Firewalk in helping raise this terrific amount for PIPS Newry & Mourne. Special thanks to Café Brass for their premises and all their support on the night, Cold Porter for providing the music and also to anyone who helped out on the night or donated raffles prizes. Thanks also to Kerry Treanor and Kirsty Louise Sarsfield for their support. PIPS Newry & Mourne would like to express their gratitude to Orla and Kerry and to anyone who supported or help them in any way.